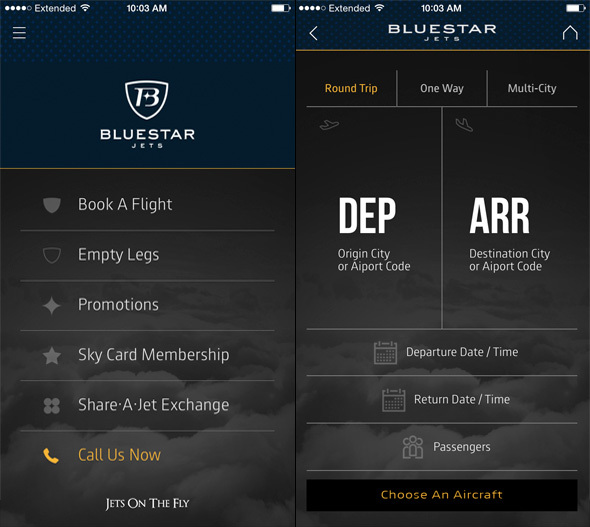 After the release of its app, Blue Star Jets president Todd Rome said the 15-year-old business is already seeing the positive effects of going mobile. Updated from June 2 to include additional information in the sixth paragraph. NEW YORK (The Street) -- As the popularity of on-demand transportation, such as Uber, continues to grow, one company is taking the lead for private jets. Company president Todd Rome said the business, which has been providing chartered flights for 15 years, has already seen a spike in both volume and interest. "The world's moving in that direction," Rome said in a phone conversation. "Customers want simplicity. And multiple operatives give them the best bid and therefore the best price." Blue Star Jets expects the app will help it double its business within the next five years -- one-third of which comes from business-related travel. The app, which is available for free on both iOS and Android, offers users the chance to compare prices, search for specific types of aircrafts and book flights instantly from their phones or tablets. Users can also book one of Blue Star Jets' empty leg flights, which fly either to or from their point of origin empty to pick up other charter clients. Flying with Blue Star Jets will cost varying prices, with chartering a light jet starting at $3,500 per hour, according to Rome. Prices depend on multiple factors including the size and type of aircraft and the number of passengers being transported. Customers can also incur additional costs for using the company's car service to and from the airport, along with other benefits of flying with Blue Star Jets. Payments for flights booked through the app are processed on customers' credit cards, similar to how payments are processed on the company's website. While there is a markup to cover costs, the company does not set an exact percentage that it receives with each flight, said a company spokesman. The spokesman added that this helps the company insure that it's offering customers the lowest costs. Rome said Blue Star Jets' app is different from other private jet booking apps, such as BlackJet, because it offers international flights and a variety of aircrafts for customers to choose. He said users can pick more traditional aircrafts, such as turbo props and corporate jets, or they can select cargo jets and air ambulances. Once customers book a flight, they will be in the air within four hours, according to the company. Blue Star Jets credits its quickness to its long-standing connections with multiple carriers, which offer the company access to over 6,500 aircrafts in the United States and 500 airports internationally. "Blue Star Jets offers our customers the most flexibility of aircraft, the best pricing in the industry because of our volume, and the most courteous and knowledgeable sales staff in the charter broker industry," CEO Ricky Sitomer said in a statement at the time of the launch.